A reflection of the start of a day in "Brook Trout Forest"
A day to pay a visit to brook trout forest, such was a day yesterday. I had not fished this stream since last spring and over the year I was surprised it had not changed which is very unusual because small streams take a beating from times of high water as well as the winds that thin out the bad limbs of trees. The day was overcast with periods of light rain. The water had a light stain to it probably from the decaying hemlocks of years past. The water flows over large rocks and several low boggy areas which are almost impossible to fish, "might be some interesting trout in those places", but that will be for another time. The fly I used to start was the fly I finished with on my last outing. This fly was the only fly I used all day other than a streamer I worked in a big pool. While I could see no rises I did notice an awful lot of midges about including several that swarmed my face. The trout were striking the fly just at the edge of the broken water in that soft seam. The strikes were very fast and hard. A lovely brook trout. As you can see his color is dark and a beautiful amber tail. Most of the brookies caught were of the same coloration. This is pretty much how this stream meandered through the forest. There were a few tricky places where care was needed when walking. It is pools like this that prove to be very interesting. The fly worked through went untouched, "there has to be a brookie in there"...will see on the way back I said to myself. That's why I always listen to myself. This fellow was lying in that pool. He took the fly and was not giving up. My little glass 3wt had its hands full keeping the fish from going into places where I knew I would loose him. When he finally came to hand his colors were different than the other brookies taken from this stream. A lovey blue color highlighted its flanks. As I finish my morning cup of Nantucket I glance out the window to see rain falling. I feel good for I know that all is well in Brook Trout Forest. Luke I'm happy to comply with your request, and I appreciate you stopping by. Yes I would say all is well in Brook Trout Forest!! Outstanding photos and love the blue halos on the side of that brookie!! Great Job Brk Trt!! Pete on that particular day it indeed was. We never tire of those blue halos. They sure are pretty fish Alan..
Nice day on the blue line. Mark even with the light rain, it was still as you said. Bill this stream was a bit kind, and I need that once in awhile. I apologize for removing my previous comment. I murdered the spelling and couldn't edit it. Chuck he was a surprise, the rest of the brookies from that stream were dark. No need to apologize buddy. Jim wild ones truly are. After seeing this post I'm ready to retire again. Kirk do you really want to do that? If you were to dream of a perfect wild trout stream I think your photos created it. Beautiful stream, with beautiful jewels to match. It's really nice to fish a stream and not have to bother changing flies much, very relaxing. Thank you Alan for the trip. Brad when I have that rare opportunity to fish without changing a fly I relish it. This stream was a joy. What an amazing stream Alan. It's so good on so many levels - one being that I think most people would look at this stream and assume it to small for anything to live... and here you are catching trout like that in it. Amazingly resilient and resourceful fish! Will this stream flows along side a traveled road and never have I seen any type of fishing activity, not even an empty worm container. Resouceful and resilient indeed. The last fish must have been shot in Technicolor. Curious how you approach water similar to that in the 4th picture. Not much cover. Would imagine keeping a low profile would be essential, perhaps a bow & arrow cast to keep movement to a minimum? Mike I have taken brookies like that before but not in such tanic water. I fish 99% of the time downstream. I cast and let the fly drift downstream. There are openings where you can poke the rod through and sort of flick the fly into the water. A low profile helps, and a bow and arrow cast to although I never cast as such. Fishing broken water is a plus, it has natural camo effect. I was going to ask pretty much the same question Mike asked. Better yet, how do you not snag every tree is sight. We need a video lesson Alan. Howard I do snag trees and assorted stream debris. It's just part of it. Beautiful trout. Never noticed the amber tail coloratiion before or that it varied. I have so much to learn about these gorgeous creatures. Their color has a lot to do with the waters they live in. 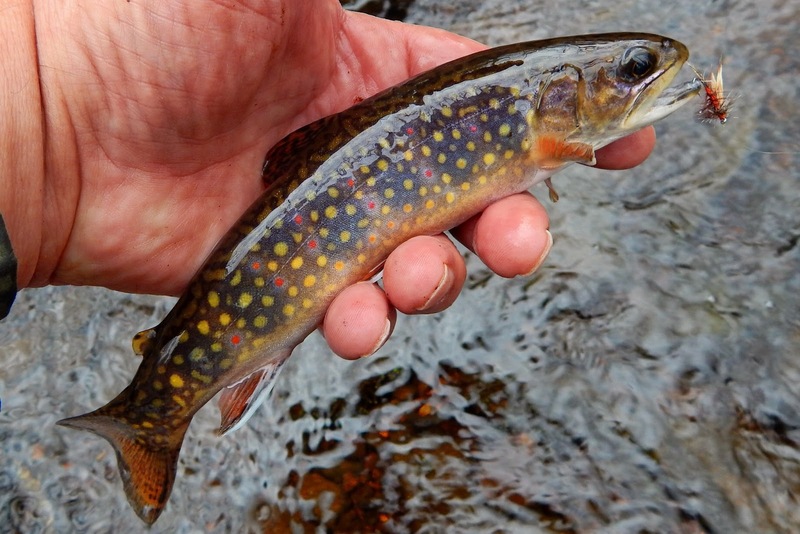 I have been fishing for brook trout for years and I'm still learning.